Ogushi did manage to stick with it for 10 more years though, and on Monday, under the ring name Kyokutaisei, he was promoted to sumo’s highest division for the first time. He also becomes the first native of Hokkaido — home to legendary yokozuna trio Taiho, Kitanoumi and Chiyonofuji — to reach the makuuchi division in 20 years. Despite admitting to feeling the pressure of expectations from his birthplace, Kyokutaisei was all smiles as he posed at his stable with the new banzuke (ranking sheet). Holding up the banzuke for press photographers and pointing to your name is a sumo staple for those promoted to significant ranks. There is no clearer indication of progress than showing just where you lie among a complete list of all 650 or so wrestlers in the Japan Sumo Association. There is no need to worry about finding a copy either. “For the May 2018 tournament, 420,000 banzuke were printed,” said Yoshitaka Tsuchiya, curator of the sumo museum at Ryogoku Kokugikan. Lower-ranked wrestlers spend the day the rankings are released stamping and folding hundreds of banzuke before mailing them out to supporters of their stables. 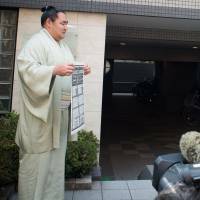 That’s something that has been part of the sumo wrestler lifestyle for generations but in recent years a new twist on the tradition has also been added — spending the day on social media complaining about having to stamp and fold hundreds of banzuke. Before all that, though, they have to pay an early-morning visit to the Kokugikan to pick up the banzuke as the actual paper, as well as its corresponding information, is released at 6 a.m.
It’s not just wrestlers at sumo HQ however. Anyone can buy copies of the banzuke and many people do. “The exact number sold to the general public also varies each basho, but for the May 2018 tournament it looks like around 25,000.” said Tsuchiya. Restaurant owners, especially those in the Ryogoku area, like to give ranking sheets as souvenirs to customers and that accounts for a large percentage of the sales. The banzuke, though, has been published continuously for centuries and as a result is a valued collector’s item for many. Stored with roughly 4,600 printed banzuke in the museum are the original versions for numerous tournaments. Those are four times larger than the 58-cm-by-44-cm dimensions of the printed banzuke and are handwritten in special sumo calligraphy by a high-ranking referee. Each one takes about a week to complete and is created after the judging department decides on its composition. Promotees to the juryo (second-tier) division as well as new ozeki or yokozuna are announced immediately to give the men in question time to prepare ceremonial aprons, set up support groups, organize parties etc. Those wrestlers usually hold a news conference the same day. The rest of the rankings, however, are kept a strict secret until about 13 days before the following tournament and guessing what they might be has become a kind of sumo version of compiling a mock draft for many fans. And just like with mock drafts, guesses are often laughably incorrect. There are basic guidelines governing the process such as wrestlers with winning records always moving up and those with losing records always moving down. The better the record the higher the jump, the worse the record the bigger the fall and so on. Those who strictly follow those guidelines however will create — to paraphrase “The Matrix” — a flawless and sublime work of art whose triumph will be equaled only by its monumental failure. The inevitability of its doom is a consequence of the imperfection inherent in every human being — or at least in every sumo judge. Twenty-three men, all with unique opinions as well as differing levels of power and influence within the group, get together on the Wednesday following each tournament to decide the fate of every single wrestler in the Japan Sumo Association. Their deliberations are also kept secret so it’s impossible for outsiders to know exactly why certain wrestlers end up at certain ranks. Undoubtedly, though no one will admit it, personal relationships and a wrestler’s popularity within the association also play a part. Osunaarashi’s demotion to the juryo division from his maegashira 3 rank in July 2017, for example, was only the third such drop in sumo history, with the other two happening in the 1700s when there were just 12 and 18 men respectively in the top division. Tochinoshin likewise has been on the wrong end of some strange decisions over the years. That fact, though, only adds a special flavor to the upcoming tournament. Under normal circumstances, 33 wins over three tournaments ranked at komusubi or sekiwake is enough to see a wrestler promoted to ozeki. Tochinoshin, however, started his run for sumo’s second-highest rank down at maegashira 3, but did win that tournament and achieved double digits again last time out. How much each fact influences the final decision is impossible to say. Some people think that 10 or 11 wins again in May will seal promotion while others feel nothing less than a second championship will suffice. That uncertainty principle is one of the things that makes sumo so fascinating and unique. Other sports with well-defined and easily calculable ranking-points systems miss out on the exciting human flavor that sumo gets from its banzuke.